You will marvel at the transformation that your home will undergo thanks to our London property refurbishment services. Whether you just need a new coat of paint in a single room, or whether you’re looking for a glamorous new look to update the décor of your entire house, our service is designed to meet and match your needs. We’ll breathe a new lease of life into your home, readying it for new tenancy, a new year, or a fresh start. We have a specially trained design and decoration team who are highly experienced at property refurbishment in London. They can choose from a vast array of top of the range materials and decorating tools, and each has benefited from extensive training and many years working in the industry. Our talented designers and artists have all been extensively vetted and insured too, so you can be completely confident when allowing them into your home. 24/7 customer service: get in touch with us at any time you need to – our support facilities are open 24-hours a day! Solid reviews: check out our reviews page now and you’ll see what our past customer have had to say after experiencing our service! Book Home Refurbishment in London Now! Call 020 3746 0607 now to book a stunning London home refurbishment! We keep our service hotlines open and fully staffed 24 hours a day, 7 days a week, so there's never a bad time to get in touch! You can choose to reach us via the Internet to, either by filling our online booking form, or using our instant web chat support facility right now. Any method you choose will enable you to get a free, no-obligation quote on whatever services you require, as well as giving you the chance to ask any questions you might have about us. 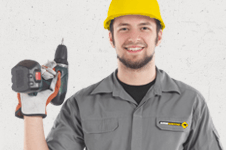 In addition to property refurbishment in London we have a range of other useful handyman services, that range from flooring services to getting general help with odd jobs. When you decide to book more than one service from us at the same time we'll be glad to reward you with a serious discount!